In 2008, Croatia goalkeeper Daniel Subasic made a pass to his teammate Hrvoje Custic. It’s a pass he has never forgotten. Many sports memories are crystal clear. Joe Sheridan cheating Louth out of a Leinster win in 2010. Ray Houghton’s goal in Stuttgart in 1988. The penalty shootout vs Romania in 1990. The great escape of May 29 1999 in the Waldstadion. Barry McGuigan beating Eusebio Pedroza at Loftus Road. In 2010 I was in Malta, in 1999 I was behind the goal where Fjortoft netted the 5th, the other three I watched in Mulhuddart. Yet there’s one I try not to remember. As I prepare to commentate on the 2018 World Cup Final I feel sick at how a corrupt Croatian politician and his cronies and a broken system killed Hrvoje Custic. I’d laughed when Igor Stimac told me this in 2003. I joked that Belgrade has the Marakana (Red Star’s home ground). Fredi Fiorentini (Hajduk Split’s General Secretary) pointed out that Croatia isn’t a Balkan country, geographically, but had a Balkan mentality. In time working there the term Banana Republic was more appropriate. The HDZ (Croatian Democratic Party) had just returned to office in the November 2003 election and with them their band of heinous goons. Chief among them, and favourite of the new Prime Minister Ivo Sanader, was Zadar Mayor Bozidar Kalmeta. Who was inexplicably made Minister of a newly created Super post of Sea, Tourism, Transport and Development (three ministries were merged). At the time everybody joked that the timing could not have been better. Irish Taoiseach Bertie Ahern campaigned for HDZ and the EU was already flooding cash into the country. The new Minister would have his grubby hands on tens of millions of euros. One of my colleagues, a former Governor of the Croatian National Bank, had direct dealings with Kalmeta on our behalf and described him as a snake of snakes. Millions were disappearing from public coffers and each time there was a raid, he kept coming up clean. Even before he was appointed Minister he was known as one of the most devious and dangerous individuals in our region. Our company had taken cases on behalf of 11 private individuals or their surviving family members whose property had been stolen by Kalmeta and his cronies. The scheme was simple. Property belonging to Croatian people of Orthodox faith who’d been ethnically cleansed by the Croatian Army or subsequent militia, or Croatian people of Catholic faith who’d been forced out by Serb rebels or neighbours, was deemed to have “unknown” owners. Our lawyers received threats from Kalmeta when they refused to back down after 18,000 m2 of land was stolen from 53 owners (and sold to a single individual linked to Kalmeta). After many years we got restitution in just one case, the princely sum of 15kn (2 euros). You see Bozidar Kalmeta had been Mayor of Zadar from 1994 until his election to National Government in 2003. He was a man who could get things done and seen off a whole range of enemies. He’d enriched himself thanks to the position of Zadar as a holiday destination, industrial and agricultural hub, and sports centre. Yet it was in sports where he had laid down the legacy to lead to the death of the 24 year old Hrvoje Custic. It took masses of street protests against he and his colleagues after a non-stop slew of corruption cases to get an election and we are still waiting for Bozidar to face jail time. He knew/knows nothing about embezzlement under his nose and was despairingly re-elected as Mayor of Zadar despite being the man who “never didn’t know nothing”. On a number of occasions Bozidar and his colleagues had refused to upgrade, improve or simply make Zadar’s Stanovi stadium safe. It would never host a World Cup Final, let alone a Croatian Cup Final, though it was a lovely spot when the crowd piled in. We played rugby games nearby and as our club in Knin became partners with rugby clubs in Ireland, we were negotiating with Munster to play a game in Croatia. In 2005 officials visited to assess training and playing facilities in Dalmatia, the Stanovi was ruled out right away by the Munster Branch on grounds of health and safety. 5-6,000 fans would be safe and happy, but the players would be in danger. 18 months on and NK Zadar (the chief tenants of the ground) had hired us to put business their way. In addition to finding sponsors, they wanted to bring touring football and rugby teams there, even just to train. Our chief engineer, Dusan, and I went to assess it. Dusan had been President of NK Dinara Knin and Dalmatian derby matches with NK Zadar were always charged, before the latter had risen through the leagues. In any case, he deemed Stanovi dangerous for rugby and recommended against using it for football due to the concrete surrounding wall. The wall in places was just over a metre from the touchline. Two months later we held an international rugby match in Knin on St. Patrick’s Day. Bozidar Kalmeta refused to attend even though we had some diplomats, Government officials and politicians of all hues. After Croatia beat an Irish Barbarian side and made the National evening news, I was called to attend a meeting with Kalmeta and his officials a week later. He fumed that we’d been able to bring foreign sides to Knin, Sibenik, Split and other towns, yet none to Zadar. I explained why, while my colleague Ante Cicin-Sain adding that insurance would be an issue for games at Stanovi. Dusan suggested they should, perhaps, remove the surrounding wall. Kalmeta waved it away, “it’s too small money to worry about.” More than a dozen requests since 1994 had been made to remove the wall, most of them when Kalmeta was Mayor of Zadar, he’d refused all. He’d set in place the scene for Hrvoje Custic’s death. I remember the moment well. I was there, on the far side of the field. I was pleased at how Jako Sport, a company we’d assisted in setting up in Croatia, had put a new sign up. We’d gotten them signed with NK Zadar as their kit supplier. They were hoovering up small clubs in all sports. NK Zadar had just returned to the top flight after a two year absence and we’d contributed handsomely to their coffers. Zadar was benefiting from foreign investment despite fears of a slowdown. I remember thinking, just after kick off, that I’d to return to Russia on Monday. I sent a text to my colleague in Knin to remind her. I remembered that I had to give the keys of our kit room to our rugby team captain. I looked up and watched as his body went into convulsions. It looked bad immediately. Hrvoje re-signed for the club as soon as they were in the first division again. To explain the type of lad he was, I met him in a cafe in Zadar near St. Donat’s Cathedral on Friday 27th May 2005, just after 11pm. The next day we had a “League Stars” Charity match. I asked if he’d join the team, mostly out of politeness, he agreed and played. He told a local Knin reporter after the game, “Every game is a World Cup Final or we don’t play football.” I barely knew Hrvoje, I prefer not getting too close to players or coaches as at some time or other they’ll leave. As a journalist it’s a must, working with club’s it’s mandatory. You can be fond of them, admire them but as has been my experience, telling a player that his contract won’t be renewed destroys you. Hrvoje treated every match like a World Cup Final. A loyal Zadar stalwart, he’d played for Croatian underage teams but wouldn’t be lining up in Luzhniki today. He’d be somewhere in the stands. He’d be smiling that big smile. I’d ask him to chat to us on Capital FM if our paths crossed, but he would have been lost in the milling red and white clad mass in Moscow today. He wasn’t going to be a superstar. He’d move to Russia most likely, play for a lower mid-table Premier League team before returning to Zadar. Right now he’d be an assistant to a man who also appeared for the “League Stars” in 2005, Dragan Blatnjak. Blatnjak had played alongside Hrvoje and liked him. Now manager of NK Zadar, he’d have brought Hrvoje in to guide the new generation. Daniel Subasic mishit a pass to Hrvoje. Hrvoje was chasing it when he fell into the wall. Daniel blames himself for Hrvoje’s death. Daniel will always blame himself. A World Cup Final victory will not lessen the pain. Wearing Hrvoje’s photo under his shirt helps, it keeps the memory fresh. It honours Hrvoje Custic. Yet we await justice. He was a local boy, a class act and victim of greed. He was a direct victim of a system that still controls too much of Croatian life and certainly football. Had Zadar removed the wall at any time before March 29th 2008, Hrvoje Custic wouldn’t have had his life support turned off on April 3rd, 2008. 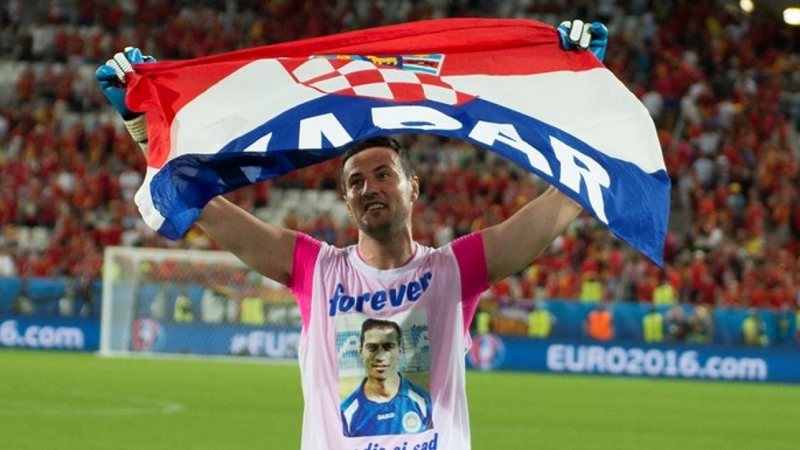 Croatia would still be in a World Cup Final today and Hrvoje Custic would be here with his friends and ex-team mates to enjoy it.